Homeschool Freebie of the Day starts this week off right with a fantastic spelling book, which uses great quotes from famous authors (Shakespeare, Longfellow, etc.) as copywork and spelling practice... with attention paid to spelling rules and trickier spellings. 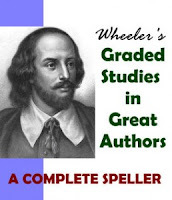 This is perfect for upper elementary through jr high spellers. Loads of great quotations too.